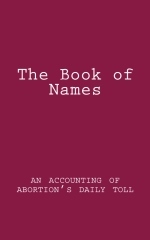 …chronicles the stories and names of all 3,877 people who died from surgical abortion on April 5, 2011. It was my Lenten writing project last year, and my hope is that it will highlight what we lose when a person is killed. Not simply their irreplaceable life, but those of their children, grandchildren, great-grands, and posterity until the end of the world. Please tell a friend about this little volume, just the right size to slip into your purse or pocket and digest in little snippets. Strange coincidence: A Chinese friend told me today that April 5 is the traditional Chinese day to go to the cemetery and honor the dead.